"At Home in Hyderabad": The future's so bright, I gotta wear shades!! The future's so bright, I gotta wear shades!! Wow. I saw where Tiger Woods dropped out of the Players Championship during the 7th hole of the final round today. The first reports out of Florida say that he has a possible bulging disc in his neck and will have an MRI tomorrow. Now we will have to endure the next several weeks as the sportswriters and the know-it-alls from the "mainstream" media begin their seemingly endless micro-analysis of what went wrong and all of the reasons that could have possibly have led to his withdrawal. 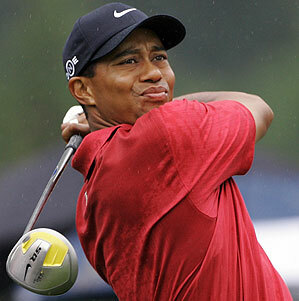 No matter what Tiger's reason, I can tell you for certain that playing golf through any type of injury is no picnic. I had a case of "golfer's elbow" a few years back. It's a lot like "tennis elbow" - except it is an inflammation of the tendon on the inside of the elbow, while the tennis-player's version is on the top/outside. The symptoms for me were a sharp pain like somebody was sticking a steak-knife into my forearm right next to my right elbow...and a weakness in my grip that was so bad I couldn't even hold a club, much less swing one!! After a couple of months off (which felt like YEARS!) - and, with my discovery of an elastic and Velcro elbow-support strap, made by the Ace Bandage people, (something that wraps around the forearm and somehow takes the strain off the inner tendon - don't ask me how it works, but it does!) - I came back. I never play golf without my elbow support now...even though I have not had any flare-ups in at least two years (knock on wood). Since I tore my left rotator-cuff tendon last month, I have not played any golf ... nor have I even swung a golf club. Well...I did take my three-iron into the back-yard a couple of weeks ago and made a few swinging motions...but I can't remember the last time I hit a golf ball. I've been thinking for several weeks now that I simply MUST get out to the driving-range and check out whether-or-not I'm ever going to be able to play my beloved game of golf again. Since I've decided to forgo the shoulder surgery, I know that I could possibly be living with this injury for the next two years. On the cusp of leaving for India for two years, this is not a comforting thought, to be honest. Not playing any golf for two years?? I'm not sure I could even think of doing that! But, if the truth be told...I'm pretty sure that I've been afraid of the truth. I've had a few opportunities to go over to our local driving range in the past few weeks...but I didn't go. You see, what if I go over to the range to hit a small bucket of balls and it turns out that I physically cannot swing a club, what will be my reaction?? How depressed will I be?? Yeah...I think I was scared. As I wrote last Friday, Amy and I took a little much-needed "mental health" break for the weekend down at The Inn at Rancho Santa Fe (just up the road and a little inland from her horse-show at the Del Mar Racetrack)...and it happens to be one of our most favoritest places in California. On Saturday morning, we got up and had our coffee. I was flipping through the "amenities" book that comes inside the room...and I saw that there is a golf course about 2-miles down the road. I told Aims that it was "now or never" - and that I was going to go over to the golf course and see if my shoulder will allow me to actually swing a club. I think she knows what an important step this was...and she sent me on my way. "I see. O.K. - and when, exactly, did you want to do this?" "How about right now? ", I said. "Well, sir, I'm sorry, but you are going to need to change into proper golfing attire!" Hmmm. I guess that my baggy grey sweat-shorts and USC tee-shirt aren't considered "proper" in some hoity-toity circles!! So, back the the hotel I go, changing into golf shorts and a collared shirt. I made my way back to the country club and said "Hi, I'm back..."
"O.K., sir...here's your club. We couldn't find a seven-iron, so I hope this six-iron will do. Oh, and you're going to need to tuck your shirt in at the range." "Tuck in my shirt??" Only because I really wanted to find out if my shoulder was going to be "golf worthy" ... I didn't tell him to stick that six-iron up his...nose! I nodded my thanks and walked out of the pro-shop and over to the bathroom to "tuck in my shirt". As I walked, I was wondering if the "Tuck-in Police" were going to come and arrest me for showing too much shirt-tail. I walked past the actual clubhouse, over a small hill to the range with the shiny new Hogan Apex six-iron in my hand and grabbed a bag of practice balls. There were only a couple of other guys banging balls out there, but I picked a spot all the way down at the far end of the range. Nervously, I dropped the first ball onto a spot of grass. I took a couple practice-swings at about half-speed. No twinges...no stiffness...no pain. Setting up to address the ball, I thought to myself: "O.K., Scott - - it's now or never!" Whack!! Straight as a string with a little draw. The ball landed out by the white flag I was using to aim at (which I found out later was 156-years from the practice tee. Shoulder pain? None. Zero!! Whack! Whack! Chunk!! Whack!! I hit almost half of the bag before I hit a truly bad shot... and it was amazing!! No pain...although I was prepared for some. I don't think I was following through as high as I wanted to...there may have been a little "ouch" at the top when I really went after one for more distance. Not all of the balls I hit flew as perfectly as the first couple of dozen...but, by far the majority were good, well-struck shots!! I finished up and returned the club to the man at the pro-shop. As a final act of radical defiance, I un-tucked my golf shirt and walked out to my car. Needless to say I was thrilled!! I can't say that the shoulder wasn't a little sore all day today...but that's why golfers my age keep lots of Advil in their bags!! I'm back!! Bring on Boulder Hills Country Club in Hyderabad! Get me a starting-time for the morning after we land!! We are all Frankfurters now!! "Ready ... Steady ... WAIT!!!!" "The poor you will have with you always...."